Don't let these pests spoil summer fun. Are you ready to enjoy summer? THE GOOD OLE SUMMER TIME !! We look forward to summer and all the great things we can do outdoors. The winter blahs are behind us, time to go to the park, the beach, the forest, time for gardening, golf, tennis, hiking, you name it, it's that time for fun under the warm sun. ALAS AND ALACK ! and oh pooey too! summer brings out the pests that can spoil your fun. I have a problem with stinging pests, not just bee's, hornet's etc. but that blood-sucking mosquito also. I will get a quarter size or larger welt that takes forever to stop pinching and itching. I just read about a girl's bad reaction from a mosquito bite. Seems there are more and new bad bugs out there now. 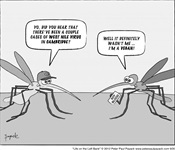 With all the rain that some area's of the country has had, the mosquito population is going to be huge. Now more than ever it's important to protect ourselves and our loved ones from these nasties! I recently moved into an apartment with a very nice porch and view. I want to be able to sit outside enjoying the weather and relax with a good book. Soooo, I started looking for repellants that are natural and won't irritate my skin, lungs, etc. I found a good recipe for a natural repellant, one Paul Harvey used for over 20 years and proclaimed it WORK'S !! Not only does it work but it protects the yard or the area you spray for at least 2 months..I will be spraying my wood porch and railings etc. The apartment management is coming next week to spray for those other stinging pests, bees, and hornets. I am happy about that. I'd like to share this recipe with you and would love to hear from you about its success in your yard or on your porch. 3 cups of Epsom salt, that amounts to 24 ounces ! 1 bottle of cheap blue mouthwash, have to check out how many ounces in a large bottle??? I thought I found a spray bottle to use, unfortunately, it sent a stream out..so I still need to find a nozzel that sprays's! I just edited this from the first posting. The words cheap really helps, as you may be aware so many products on the market are very expensive and do they work as well? Are they safe for the environment and our bodies??? I'll find out soon and it won't cost me an arm and a leg to try it out. Check your dollar store for the ingredients.. Enjoy your summer and stay free of bug bites!